Welcome parents, pupils, grannys, grandads, uncles, aunties and anyone else who is interested in the goings on in room 2! Over the year this blog will be filled with, info, stories and photos of all the things the boys and girls get up to as they begin their journey of learning at Scoil Mhuire Clondalkin. So check back often, comment, like our posts and enjoy the blog! 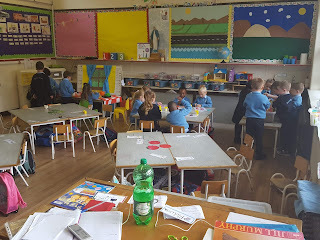 Check out the boys and girls in room 2 enjoying Aistear play. 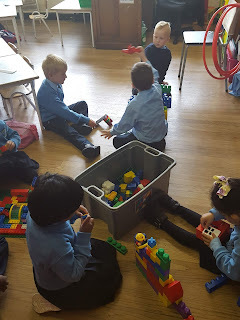 Aistear allows the children to explore, communicate, problem solve and work on fine motor skills in an informal, fun, play environment. 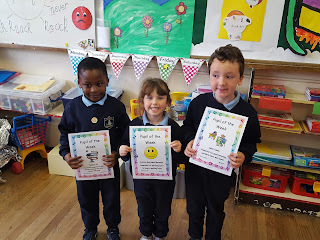 Well done to our recent pupils of the week- Twaibu, Aubree and Sean. Pupil of the Week is awarded to a pupil for hard work, excellent behaviour, good listening or other positive behaviour that teacher feels deserves recognition!